We thank you for your time and look forward to connecting. 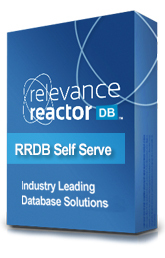 For more information on Relevance Reactor’s Database solutions, to discuss your DB needs or to see a live demo, please contact us anytime by filling out the form on the right. You can also reach us by using the contact information below. If you would like to get started with RRDB Self-Serve today or would like to register to get started with RRDB Custom you can do so anytime by clicking the orange tab on the side of your screen or on the get start tab below.